8-days on from making the shock announcement that after 13 years of racing for HB the had left the team, Atsushi Hara claimed a ‘special win’ today as he became the FEMCA 1:8 Offroad Champion after a near perfect day at Fengtai Raceway in China. Racing as a privateer with a Mugen that he went out to a hobby shop and bought himself, the Japanese ace won the 1-hour final easily from Top Qualifier Dani Choi and Sheng Chie Huang who had a great battle towards the end of the race. Starting from pole position, 2008 World Champion Hara was the class of the 12 car field which saw 7 different nationalities represented. The only driver to record a 28-second lap in the main, he said afterwards he was ‘really happy’ with regaining the title he last held in 2010 as he said his announcement last week for sure brought a lot more attention to the event. While he had a different chassis to get used to, he said the biggest change was actually not having his long time and much trusted mechanic Masayuki Miura, one of the most famous partnerships in the sport. 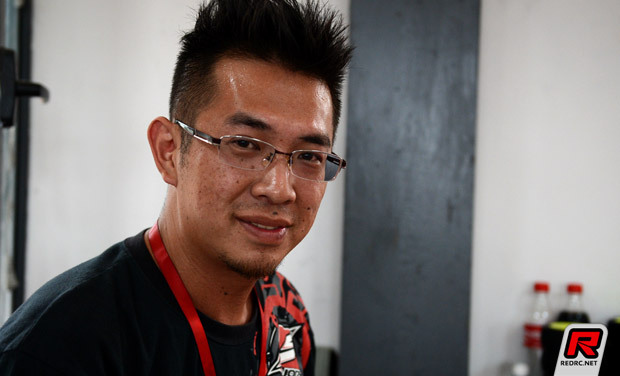 Working with the mechanic of top onroad nitro racer JJ Wang, he said while AI’s work was good it was having to communicate in English that was the biggest problem. With that improving each day of the event he said having Wang on hand for finals day helped a lot and he thanked them both for the input in today’s victory. In terms of the race Hara said his main worry was tyre wear. Feeling white compound HB Grid Lock would have been his best option for the final he said a lack of tyres meant he had to run the medium red compound and this played a little on his mind early in the race. Proving to last better than he expected he said once he stayed on the racing line running on the heavily worn tyres was no problem. ‘I was the fastest human in the race as Hara is not Human so I am very happy’, that was how Choi summed up his race. 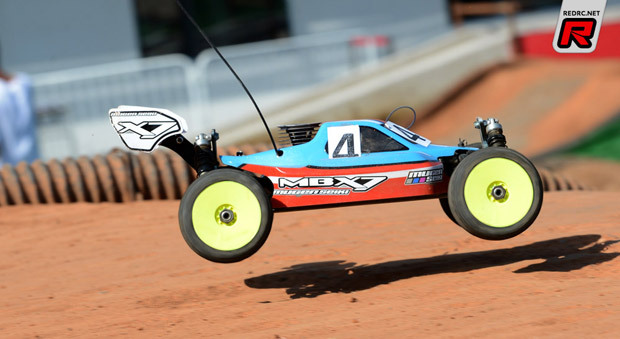 The Sweep employee and designer of the ‘Birdy’ bodyshell he ran all week here on his Kyosho said at the start of the race his MP9 steering was a little sensitive at the start of the race on the fresh set of Sweep Exagon tyres but then after was easy to drive. Mishearing a call from the pits which he thought was for him he had one botched fuel stop. On hearing the call he came into the pits but as it was not his crew who made the call they weren’t ready and so he had to exit the pits unfuelled returning a lap later to his now ready pit men. Trying to stay calm after the incident Choi was able to close up on long time second placed Huang in final stages of the race. After an entertaining battle, which was the highlight of the race, a mistake by the Taiwanese driver allowed Choi through for the runner’s up spot and his first international race podium finish. Also claiming his first international podium finish, 28-year-old Huang was delighted with the result. Having looked strong for second position for most of the race, the HB driver said his red compound HB Grid Lock tyres were finished when he was caught by Choi and there was little he could do to defend the position from the Korean. Other than this he said the D812 and Alpha engine performed perfectly. 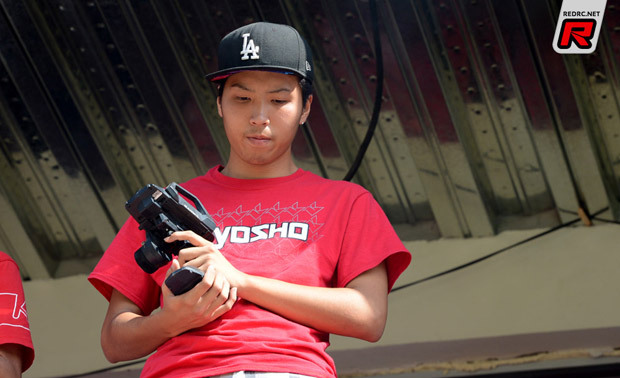 Suffering an engine flame-out, 17-year-old Japanese talent Wataru Takashiro finished fourth. Starting from 8th on the grid, the Kyosho driver was disappointed at missing out on a podium having got his MP9 up to second before suffering an engine cut. With fuel still in the tank, he said his MP9 felt really good and had his OS engine not stopped the buggy was good enough for a Top 3 finish. 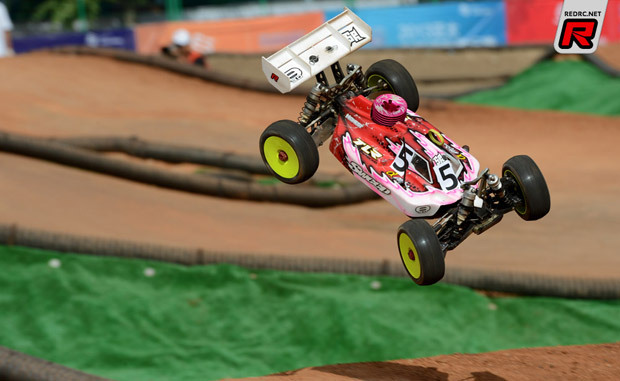 Having missed out on the final at last year’s FEMCA Championship, which took place in Thailand, Sweep front man Ryan Lee was delighted to finish 5th overall with his TLR saying he ‘Maximum enjoyed’ the race. 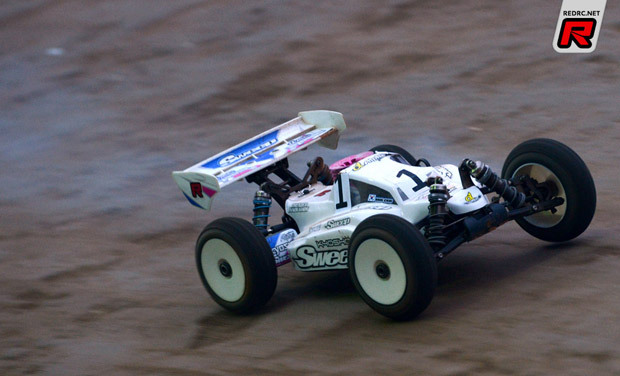 Finishing on the same lap as Lee, British racer Tommy Chung completed the Top 6 with his Kyosho. The most significant retirement of the race was Yuichi Kanai, the Kyosho designer breaking a front suspension arm on his MP9 just after the mid point of the race leaving the 2000 World Champion to be classified last. For the two Chinese drivers to make the Main, it was Hu Wei Ping driving his S-Workz who took the honour of best placed driver from the host nation finishing 8th overall with the Hong Nor of Lin Le Hua finishing one spot behind him in 9th as the last driver to go the full distance. 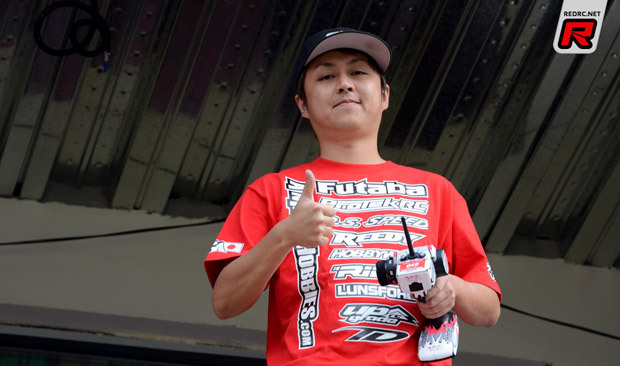 Atsushi Hara is on pole position for the 1:8 Offroad FEMCA Championships after the Japanese ace convincingly won his Semi final in the faster time. A lack of clarity in the ruling meant there was a long wait before the grid was finalised with officials disagreeing on the interpretation of the rule. JMRCA representatives were adamant that the rule should see the pole position go to the winner of the odd Semi final as this was deemed the faster race as it contained the Top Qualifier. With Sheng Chie Huang beating Top Qualifier Dani Choi this would have but the Taiwanese driver on the pole for the 1-hour title deciding race. 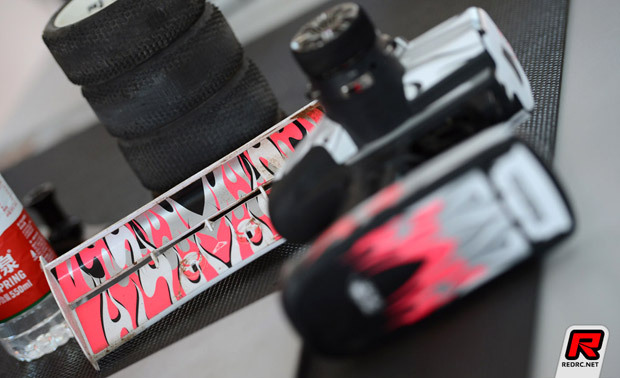 In the end a call to IFMAR’s Sander De Graaf saw the ruling interpreted as the driver with the fastest time from the 2 Semi finals getting pole position, Hara’s time being 2 laps faster than that of Huang. Commenting on his race, Hara said he was happy with his performance saying that it was the best he has driven all week. Having adjusted the rear toe on his Mugen said the change made the buggy a lot more stable and comfortable to drive on the track which he said has a lot more traction than in qualifying. With the heavy tyre wear clearly visible on his HB tyres, Hara said despite this didnt make the buggy too slow. With the final twice the distance the former World Champion thinks he can do the race on just one set of tyres but added that he will monitor his lap times compared to any drivers that do change tyres during the race. If the gap is substantial he said he then may opt to change. Top Qualifier Dani Choi, who will start 4th on the grid behind Huang and Thailand’s Charlee Phutiyotin, said all excuses aside he was just too slow. The Sweep team driver said he made too many mistakes and with his engine too rich he was also forced to make an extra fuel stop. With his tyres looking more like slicks after the run the Korean said this was due to the fact that he ran the same tyres as he used in the morning’s 15-minute Semi Warm-up adding that he thinks running the entire Main on one set of tyres should be fine. 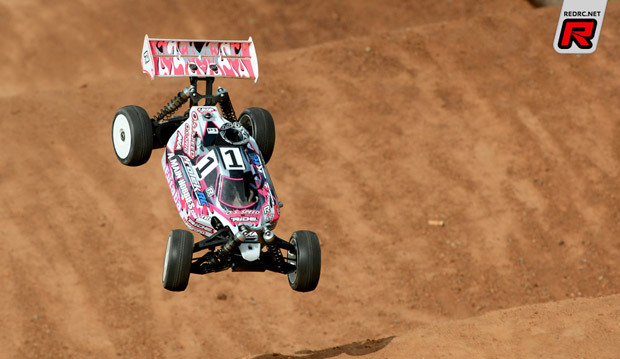 In terms of set-up he plans to lower the ride height on his Alpha powered Kyosho. For the other two world champions there was contrasting luck. Nitro Touring Car World Champion Meen Vejrak was leading the second of the Semi Finals and looking strong when his steering servo started to burn out eventually forcing the Thai ace to retire at the 17-minute mark. For 2000 1:8 Offroad World Champion Yuichi Kanai he had a heart stopping moment when his RB powered Kyosho stopped with just 5-seconds to go. With his mechanic unable to get the engine restarted so as the MP9 designer could finish the race he thought his event was over but luckily for the Japanese driver such was the timing of his cut out and his gap over those behind him he would still be classified third ensuring he bumped up to start 6th on the grid. With the engine cut not due to a lack of fuel Kanai thinks something in the engine is broken and for the final will fit a new one. 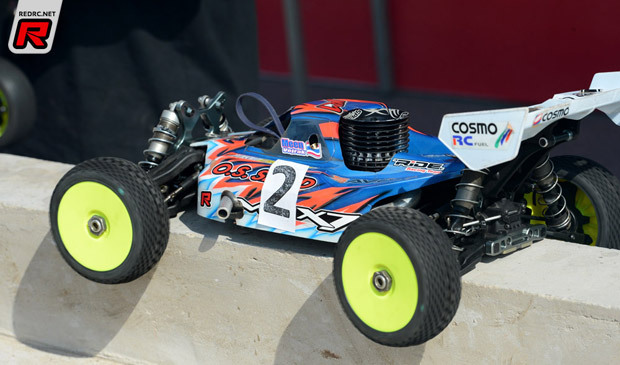 Another key retirement in the Semis was Japan’s Dai Hiroki, the Japanese driver suffering a similar faith to Vejrak as he too went out with a steering servo failure on his Kyosho. For the Chinese there was plenty of reason to celebrate for the host nation as they will be represented in the final by both Hu Wei Ping and Lin Le Hua who will start 11th and 12th respectively. 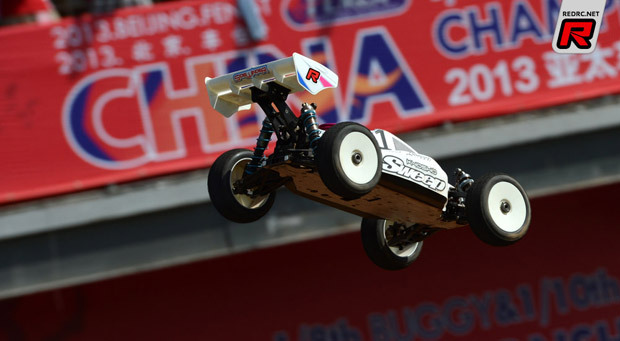 The big day has arrived at the 1:8 Offroad FEMCA Championships in China, proceedings getting underway with the 1/4 finals which have seen the entry now whittled down to the final 20 who will battle it out in the Semi Finals for one of the 12 starting spots in the evening’s title deciding 1-hour Main final. In the first of the 30-minute 1/4 finals, it was Singapore’s Liu Man Yet who took his OS Speed powered Mugen MBX-7 to victory. Setting the fastest lap of the race he had an 8-second winning margin over the HB of Taiwan driver Chun Chi Chen. Starting from 7th on the grid, having bumped up from yesterday’s 1/8 final, China’s Lin Le Hau completed the Top 3 to keep his HongNor in the event after claiming the final grid spot for the first of the Semi Finals. Having bumped up from yesterday 1/8 Final, Chinese National Championship runner-up Lien Sheng Chang saw his event come to an end. Lining up last on the grid, the SH Engines owner made a great start running second early on. Slowly dropping back down the order he would eventually retire with a broken car just before half distance. The second 1/4 Final encounter was won by Li Cong despite the Chinese driver having some difficulty with traffic. 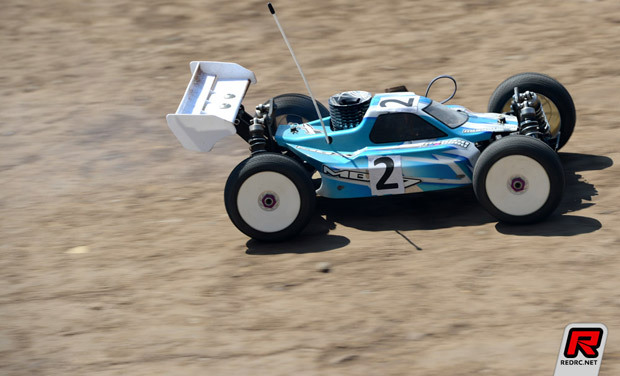 Driving his Novarossi powered Kyosho, he took the lead of the race 8-laps in after which he would never again be headed. Starting from 6th on the grid, 13-year-old Thai talent Witchapoom R took his Agama to second spot. 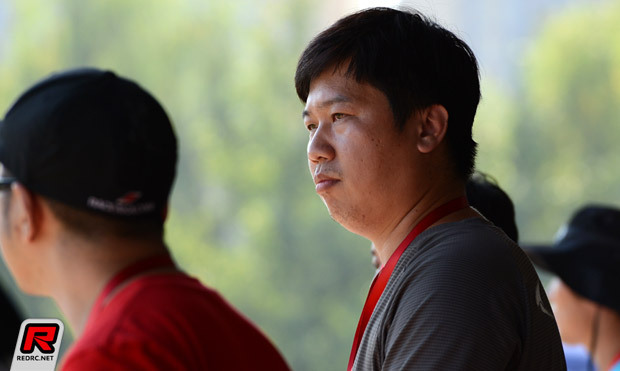 Securing the final bump up spot to the Semi final was 4-time former Chinese National Champion Hu Wei Ping. Starting from pole, the S-Workz driver had a bad start which left him 7th at the end of lap 1 but setting the fastest lap of the race he was able to work his way back up the field to make the all important Top 3. 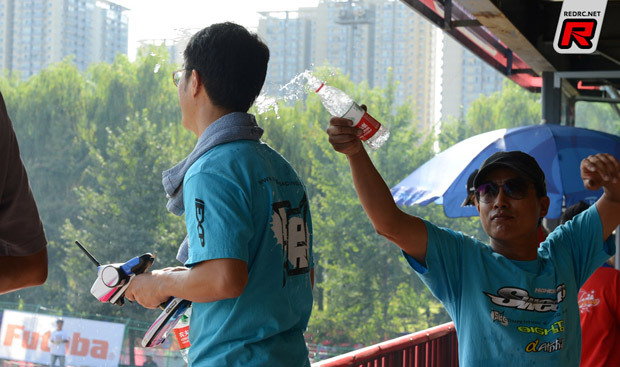 For newly crowned Chinese National Champion the race would see the end of his FEMCA challenge as he would retire his Z-Car from 6th position with 7-minutes left on the clock. 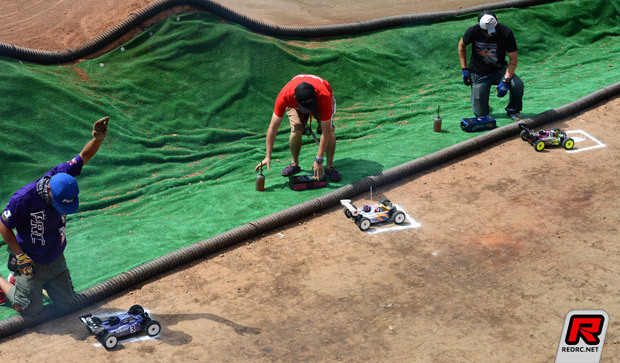 Today’s action at the FEMCA 1:8 Offroad Championships was made up of the lower finals with the 1/8 Finals bringing proceedings to a close and determining the 6 drivers who will progress through to tomorrow’s main title deciding day. 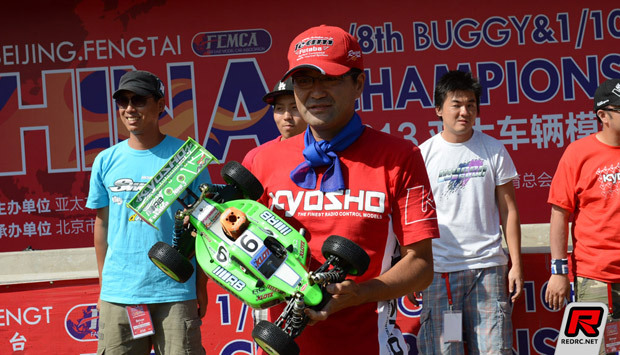 In the 1/8 Even Main it was Singapore Mugen driver Yeo Seong Leng who took his Ninja powered Mugen to the win. Staring from 4th on the 10 car grid he took just 3 laps to find his way to the front of the field only relinquishing his lead when he made his fuel stops. 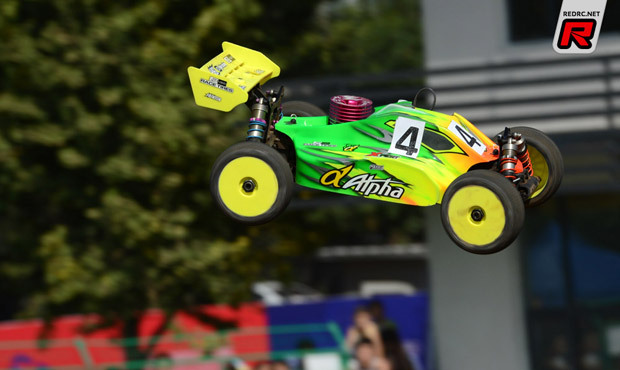 Finishing 15.763 seconds behind on the 30-second lap Fengtai Raceway track was Taipei driver Kuo Luang Yang who was at the controls of an Alpha engined S-Workz. Completing the Top 3 and therefore the final driver to progress through to tomorrow’s 1/4 Even Main was Z-Car driver and SH engines owner Chang Lien Sheng, the Taianese driver having earlier in the day finished runner-up in the Chinese National Championships which were ran alongside the FEMCA event. In the second of the 1/8 Mains it was newly crowned Chinese National Champion Wu Chin Yi who dominated proceedings. Starting from second on the grid, the Taiwanese driver set the fastest lap of the race and took his Z-Car to the win a full lap clear of the Mugen of pole sitter Dan Hoisuk. 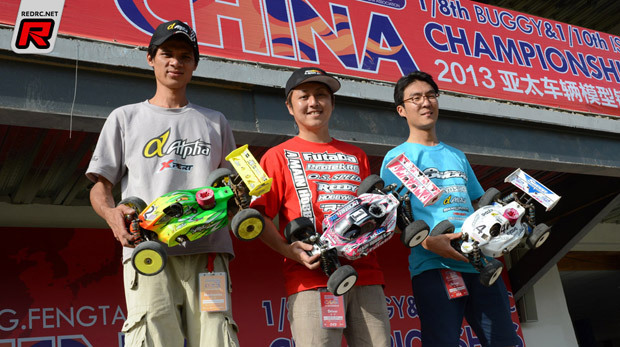 The Top 3 was completed by Chinese Hobao driver Tang Bi who benefited from a late and costly mistake by John Ho. Driving a Kyosho, Ho was running a comfortable third and holding the final bump up position when he made a bad landing and collected one of the track piping pegs. The impact broke the front right suspension arm forcing him into retirement at the 25-minute mark allowing Bi to progress to the Main finals day. 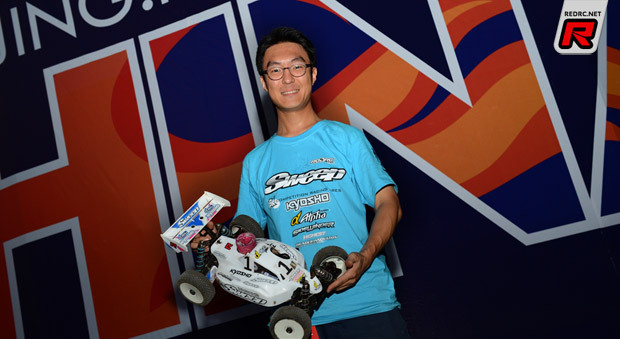 A delighted Dani Choi claimed his first ever international race TQ honours this evening in China when the Korean topped a exciting final round of qualifying at the FEMCA 1:8 Offroad Championships. 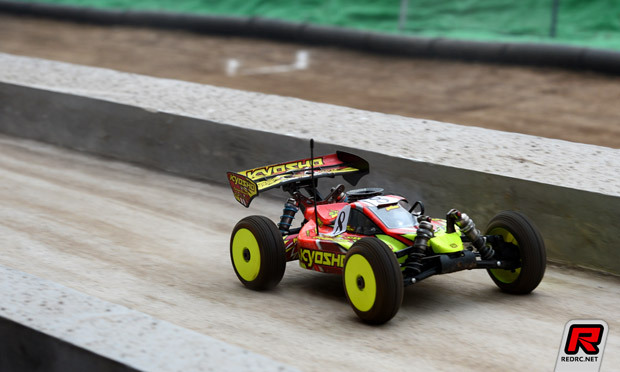 The Sweep tyres team driver took his Kyosho to a third TQ run around the Fengtai Raceway track after mixing it with Atsushi Hara and Meen Vejrak in the dying moments of the 10-minute heat. In the end tyre issues cost Vejrak a potential second TQ run on the final lap leaving him to post the 4th fastest time while a series of mistakes dropped Hara back to third behind Kyosho’s Dai Hiroki. ‘Can’t believe it’ was Choi’s reaction to the result. Going into the final qualifier tied on points with Hara he said he just tried to ignore Scotty Ernst’s commentary but towards the end of the race he found himself battling with two world champions. Running the same set of Exagon tyres he used to TQ the penultimate round of heats, he said his MP9 was really good and the hardest thing was actually trying to stay calm as he ran wheel to wheel with Hara and Vejrak. 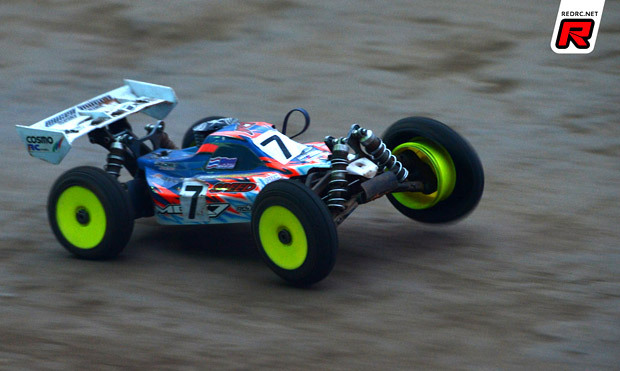 Looking forward to Saturday’s Semi Finals, Choi said with his buggy performing so well and also being extremely good in terms of tyre wear, his tyres after two 10-minute qualifiers still looking like new, he said the plan is just to fully rebuild the buggy and for the race itself keep calm. Set to start on pole position for the other Semi final having qualified second overall, Hara said he just made too many stupid mistakes in Q6 after which he then started to overdrive. Annoyed with himself for his first crash he said it just got worse after that but in terms of the buggy he said it was the best feeling he had with the Mugen since the start of the event. Having brought a 50/50 mix of AKA and HB tyres, Hara said he had to switch to HB’s tyre in the final qualifiers as he had run out of Impacts but he said the red compound Grid Locks worked really well. Qualifying third overall Nitro Touring Car World Champion Vejrak said extending his wheelbase improved his MBX-7 for the low traction but unfortunately bad tyre gluing let him down. With the front left tyre going first he said he was still able to control the buggy easily enough but when two more of his Procircuit Hot Dice tyres came undone it was impossible to stay in control. This led to the talented Thai star to get out of shape right in front of Choi causing the the Mugen to end up on its roof. Asked about his Semi-final plans Vejrak joked that better gluing of his tyres was his main goal! 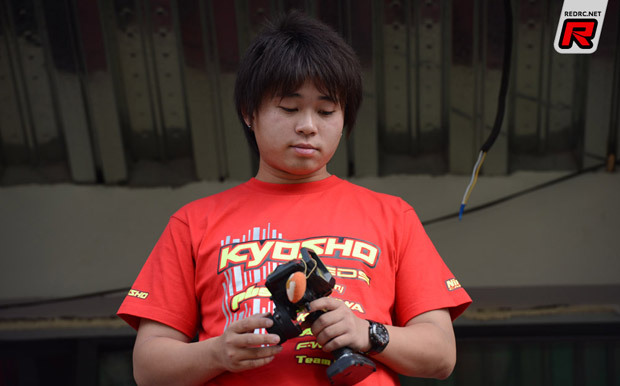 Finishing second in Q6 was enough for Hiroki to out qualify Kyosho legend Yuichi Kanai and secure 4th overall. Running in the second fastest heat grouping he was surprised by the result as he had made a few mistakes. Happy with his Reds Racing engined MP9 he said he plans to stick wit the same set-up for his Semi half hour Final. Ending qualifying with his worst run of the six rounds, posting only the ninth fastest time, Kanai ended qualifying fifth overall but driving well this week he should be competitive in his Semi final in which he starts 3rd behind Top Qualifier Choi and Vejrak. Ending qualifying with another Top 5 finish, despite his engine being too rich, Chavit Saliguppa secured 6th overall which will see him in the same Semi as Hara and Hiroki. Completing the Top 6 in the final qualifier was 17-year-old Wataru Takashiro who after a tough start to qualifying yesterday was delighted to be able to turn things around today and qualifying into the Semi finals with 11th overall. The Japanese driver will be joined in the Semi Finals by his father Manabu who posted his first Top 10 time in Q6 to leave him 14th overall. For the host Nation qualifying saw Hu Wei Ping ensure that at least one Chinese driver will be represented in the final. The S-Workz driver who will be hoping to secure his 5th Chinese National title in the morning matched his best run of 11th fastest in Q6 to secure 15th overall. Unfortunately for Li Cong the only Chinese driver to post a Top 10 time, he missed the cut by a single point with Thai driver Akarachai Boontham securing the 16th and final direct Semi final qualifying position. Ending up 17th Cong will starting the even 1/4 Final from pole position.